Despite low number of visa holders, the Department of Homeland Security said the countries are not in compliance. 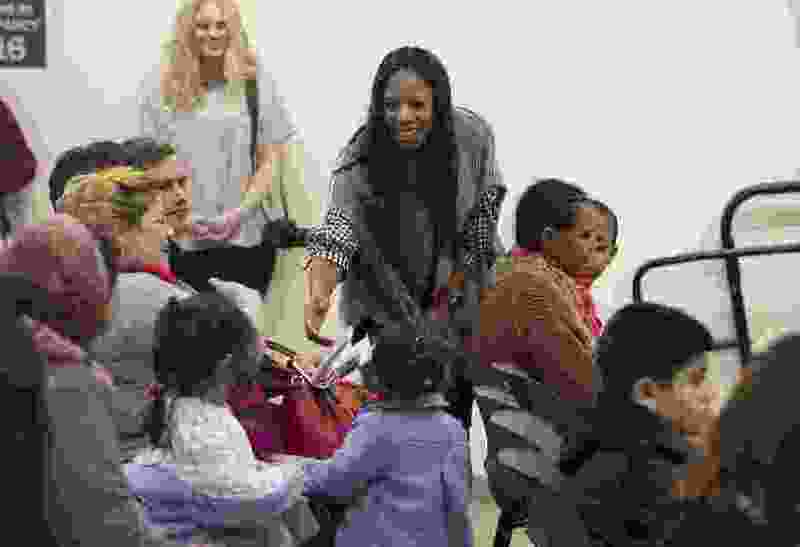 (Scott Sommerdorf | The Salt Lake Tribune) Rep. Mia Love reaches out to shake the hand of a parent prior to a ceremony recognizing children who have obtained citizenship through their parents, Thursday, December 28, 2017. Some children were adopted by U.S. citizen parents; others derived citizenship when their immigrant parents became naturalized citizens. Just days after she called on the president to apologize for a vulgarity, Utah Rep. Mia Love is criticizing a Trump administration directive this week to remove Haiti, Belize and Samoa from the list of countries eligible for seasonal worker visas. In that controversial White House meeting, Trump scuttled a bi-partisan agreement that could have resolved the debate surrounding DACA (Deferred Action for Childhood Arrivals program) as well as other immigration issues, including border security. The visas in question are typically given to seasonal workers in agriculture and other industries. They are available to 80 other countries. But according to the Reuters news agency that cited a DHS report, only 65 Haitians entered the U.S. on visas for agricultural work and an amount “too low to report” entered on visas for non-agricultural seasonal work during 2016. Further, in November, the Trump administration said it would terminate the “temporary protected status” granted to Haitians under former President Barack Obama as a response to the Jan. 12, 2010, earthquake. It leaves 59,000 Haitians subject to deportation. Belize, population 390,000, was disqualified from the worker visa list for not fully meeting the Trafficking Victims Protection Act, according to DHS. And Samoa was excluded for not cooperating with the United States on deportation of Samoan nationals. Although Haiti is a country of about 11 million people, Samoa is home to only some 197,000 residents. Junior Papalii, a leader of Salt Lake City’s Samoan community, said he can’t understand why the president and DHS would take such a punitive posture against the island nation. Earlier this month, the Trump administration announced it would end the temporary protected status for some 200,000 Salvadorans in September 2019. They were granted that status after earthquakes in El Salvador killed 1,100 people and displaced more than 1 million in 2001.